Berg, left, at Forage during a recent “Know Your Farmer” dinner. 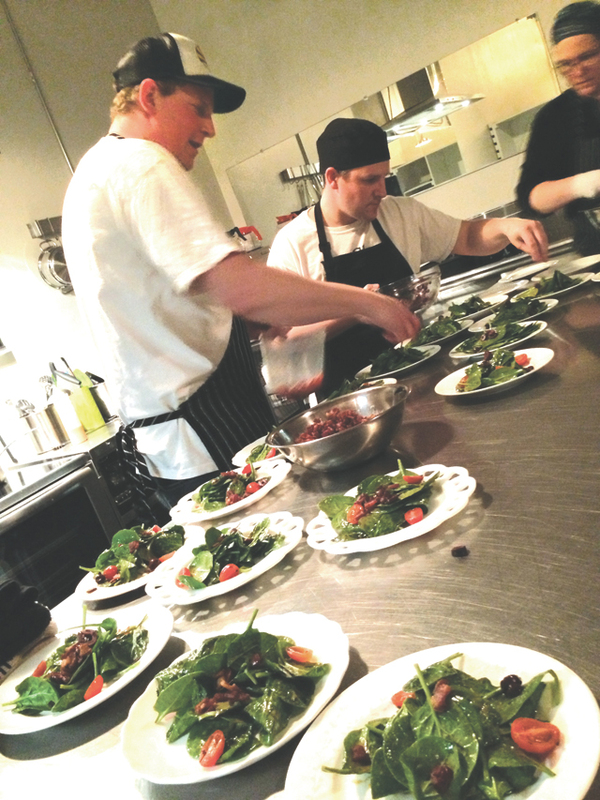 Berg’s cooking classes at Forage start April 7. Each Tuesday evening in April, a class will be offered in which you can finesse your kitchen techniques. Attending will certainly heighten your enjoyment of being in the kitchen and teach you to bring out the utmost flavor from your locally sourced foods. Learn how to respect your tools and the clock in this class designed to enhance the skills you are already using. Cooking can be far more enjoyable when you are using the right knives, having sharpened them well, while gleaning an understanding of these basics: sautéing, searing, blanching and braising. Organization and time management will be key elements here as well. By filling your pantry with homemade items you save money, cut down on waste from containers and can be certain of the ingredients that are included. Learn to make basic kitchen essentials from scratch: butter, buttermilk, mayonnaise, roux, simple syrup, galette, vinaigrettes, and many more. Making your own bread is an exercise in homemaking: creating smells, nourishing bread, that fresh from the hearth feeling. That can’t be bought! This course will cover the basics of creating hand-formed breads (like whole wheat and sourdough), fresh pita bread, flatbreads/focaccias, pizza dough and others. *Participants in this course will receive a small batch of Nathan’s infamous “Marqy Marq” sourdough starter. You will create and dine on your own 5-course meal. So that you may be able to recreate this experience at home, Chef Nate Berg will focus on “menu creation/organization, flavor combinations and progressions, kitchen improvisation and plate presentation.” This will be a great lesson in advance of Farmer’s Market season, so you may be able to base your future meals on the ingredients you are able to source in any given season. All classes begin at 6:00pm and will last approximately 3 hours. Classes are $60/person, or $200 for all four. Space is limited. Please email forage.ec@gmail.com to register or for more information. Laura Lash is a mother, yoga teacher, writer, and contributor to Chippewa Valley Family.